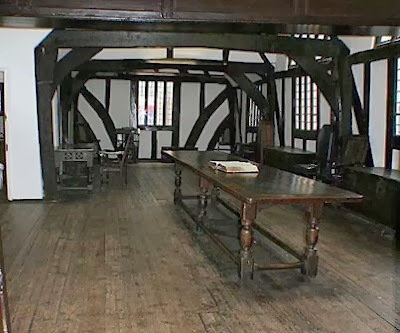 Reputedly the city's most haunted building, The Guildhall in Leicester has long been coveted by paranormal investigators and was featured on Living TV's 'Most Haunted' in Series 4, an episode notorious for its alleged activity captured on camera. The building itself is a stunning medieval struntedcture which has been in use for over 600 years. It was built in 1390 as a meeting place for 'The Guild of Corpus Christi', a group of very powerful men who controlled what went on in the local area. When this group was dissolved however, the building was bought by the corporation of Leicester and in 1632 it became the new home of the town library. This still remains, and is credited with being the third oldest library in Britain. The Great Hall in this time was used not only as a courtroom, in which sentences were handed out and important decisions made, but as a banquet room, a theatre and a place for civic events. It is said that Shakespeare himself once performed there. And so it remained until 1876, when it became Police HQ and a school combined. It was turned into its present day guise as a museum in 1926. It is home to at least 5 ghostly residents, the most active of which is known only as 'the white lady'. She makes her presence known by shifting heavy Tudor furniture around in the library, and opening locked doors at night. Several times the police have been called out because something has set the motion sensor alarms off at night. When they investigate they find that several locked doors have been opened and that pieces of furniture have been moved into strange positions. She is particularly attracted to the large King John's Bible which resides on the table in the library. Although it is always closed by staff at night, the next morning they find it has been opened to exactly the same page each time. It appears that the White Lady may be of a religious background, as a huge bible within the Library is often found open when staff have closed it the night before. This has led some people to actually considering the fact that she could be a monk in light robes...The presence of a police officer has been encountered numerous times, by various people. His footfalls are often heard in and around the main entrance area to what was once the constables cottage. Other activity includes the frequent noise of heavy footsteps around the museum, especially crossing the courtyard to the constable's cottage. This is attributed to one of the Victorian police officers, as well as those footsteps heard coming from the roof space, the ex-living quarters for those police stationed there during the late 19th/early 20th Century. There are also reports of a cavalier in the Great Hall, as well as two animal ghosts, a black cat that often trips people on the stairs and a phantom dog in the court yard. Several visitors have also reported a great sense of anxiety and of not being alone when sitting in the original police cells.